Previously, the focus was on the quantity of links leading to your website and marketers used the phrase ‘the more the better’. With recent algorithm changes, Google now penalise this practice, putting a large focus on quality over quantity. It is now crucial for digital marketeers to generate high quality backlinks which are not deemed as ‘spammy’ by Google. In order to ensure you don’t gain any bad links to your website, you should be using the disavow tool in order to remove any unwanted links in order to ensure you avoid any penalties. Therefore, only natural and valuable link building will generate authority to your website to help your rankings. Content is now key to any SEO strategy. The Google Panda is now one of the key Google Algorithms, meaning your website needs rich and engaging content for your users. This algorithm update has put a stop to ‘keyword stuffing’ meaning all content has to be of a high quality and can’t be duplicate content from any other website. Again, you could face a serious penalty if you utilise this practice. This means, some of the best ranking website on Google are those who produce the most valuable content through utilising platforms such as their blog. Local SEO in 2016 is a completely different picture compared to several years ago thanks to the Pigeon Algorithm. This has meant Google now rewards links to high authority directories and the use of Google+ and Google My Business for your website. Local searches have become a lot more common with a huge increase in ‘near me’ searches. This is due to the rise of mobile devices taking over desktop searches. 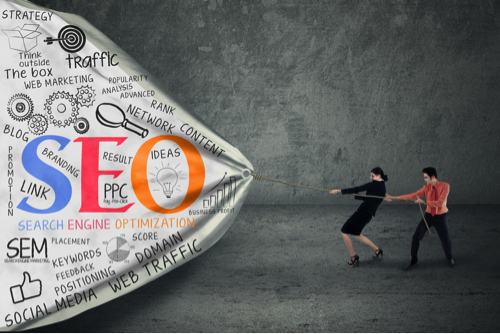 If you need help or advice with your SEO strategy, get in touch with us today.